In an age unheard of, where barbarous kingdoms battle for survival in a savage and unforgiving land... you stand alone. You, the great and mighty Conan, born of pure Cimmerian blood, will claim what must be yours... the throne of Aquilonia. Yet, beware! The journey is a dangerous one, with enemies and challenges at every turn. Flying demons assault you, fiendish spirits lash out, a nymph challenges you. What is her plan? Only Conan dares to know the difference between subtle temptress and menacing foe. Now, explore the entire world in the true adventures of Conan, the greatest barbarian hero ever. Every detail of the Hyborean world has been captured in this multi-level super-action game. 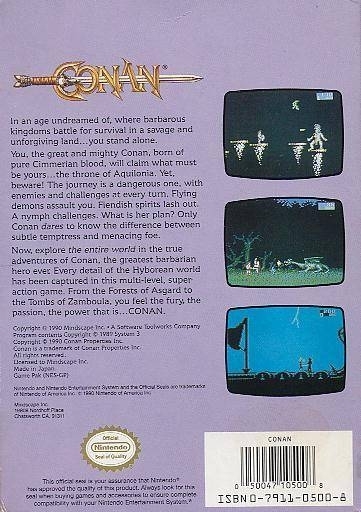 From the Forests of Asgard to the Tombs of Zamboula, you feel the fury, the passion, the power... that is Conan! NES version is the best and its not even HD!